Imagine a low-frequency transducerpowered by an advanced, energy-saving built-in amplifiers. Envision flawless JBL bass beguiling your eardrums – bass so tight that every note is held to its proper duration, and with all the right harmonic overtones. Picture this, and now listen to the Studio SUB 250P’s 10” PolyPlas transducer. Hear any difference between your imagination and reality? We didn’t think so. Not only is the SUB 250P’s 200-watt amplifier a powerhouse in the realm of home entertainment, but it’s also one of the smartest. 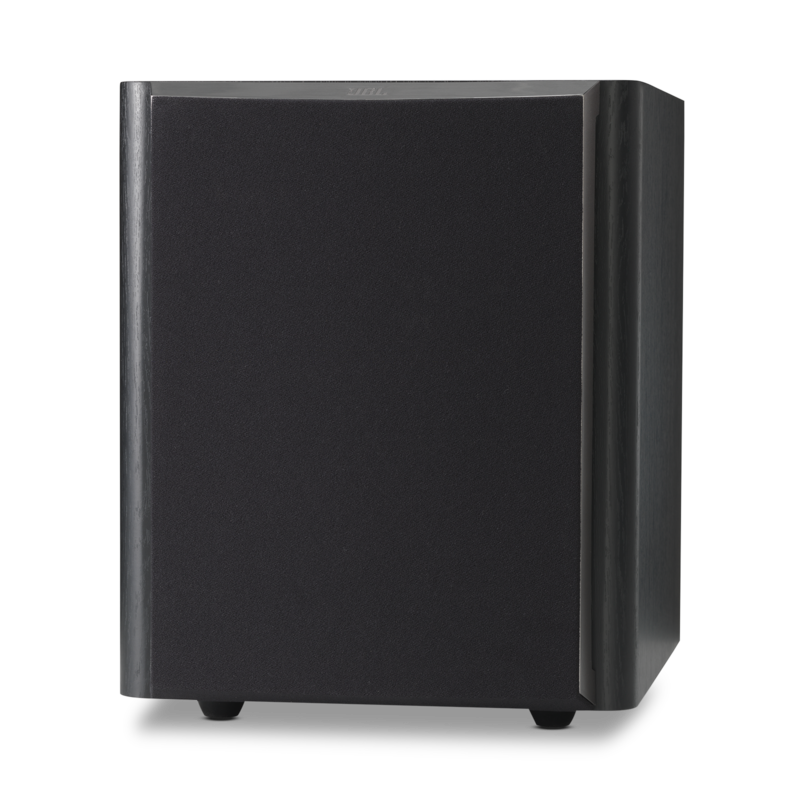 Its Class-D energy rating allows the amplifier to cool itself naturally – saving it from danger of burnout – and saving you from a higher electric bill. Its rear-mounted inputs and controls allow for discrete, easy set-up and integration with other loudspeakers in the Studio 2 Series. The JBL way is to make it look as good as it sounds. And with our Studio SUB 250P, we’ve made no exception. With its 21st century elegance – including a solid cabinet construction with no visible fasteners, softlyrounded edges, a gloss black top panel, and a customized soft-touch paint scheme – we’ve built something that seduces your eye as much as your ear. Raw bass power – refined to perfection. 67 years in the making, we can safely admit it: we’ve pulled off another loudspeaker series that's powerful, precise, and hedonistically refined. It's our new 10-piece JBL® Studio 2 Series. And we never could have done it without engineering something as undeniably as our SUB 250P powered subwoofer. Tested relentlessly in our JBL sound lab – the most accurate of its kind in the world – as well as pitted against competitors in real world comparative listening studies, we’ve created a powered subwoofer that others can only hope to catch up with – but never measure up to. With a hair-raising 10” PolyPlas low-frequency transducer powered by a 200-watt Class-D high-efficiency amplifier, along with a rear-firing Slipstream bass port that goes beyond anything you’ve ever heard when it comes to undistorted opulence of sound, your ears will be confounded by the richness and rawness of tight, fast attack bass with flawless harmonic overtones and natural note decay. And with signature touches like luxurious gloss black paneling, solid cabinet construction with soft-rounded edges and no visible fasteners, and a choice of either a Black or Espresso woodgrain finish, we’ve done for the eyes what our bass has done for the ears. We’ve combined the power and precision of high-tech audio with the sleek urbanity of “it-factor” design. For those able to hear the truth, we’re confident you’ll know the difference just by listening. Studio SUB 250P is rated 4.3 out of 5 by 16. Rated 5 out of 5 by annoyingnerd from Pumps out the bass I'm no connoisseur of speakers but this rocks my house. Very impressed. Set it up on a 7.1 system (have 6 jbl 8" in wall speakers, 1 JBL center channel not in wall). Love the sound quality and ease of setup. Rated 5 out of 5 by Clamtown74 from Music2 sub replacement Bought this through Harman/JBL to replace worn out music 2 sub. It has turned out to be a great purchase. Excellent sound and offers the adjustments that allow custom sound per room placements. Rated 5 out of 5 by dantesgate from The control adjustments provide unlimited choices. Being an "old school fan" we had the luxury of 3-way speakers, . . . & that was it ! At first, I thought this subwoofer was just another gimic, . . . far be that from the truth. It is like having live recording/performance with the Bass player of the band in your own personal entertainment room, . . . in your HOME ! BOOM . . . BOOM ! How nice ! ! ! A BEAUTIFUL touch . Rated 5 out of 5 by astronut from Great sound. After reviewing several subwoofers on Amazon, I went directly to the JBL web site and found the SUB 250P on sale much cheaper than on Amazon. JBL has always built premium sound equipment, so I did not hesitate to order one for my new home theater setup. 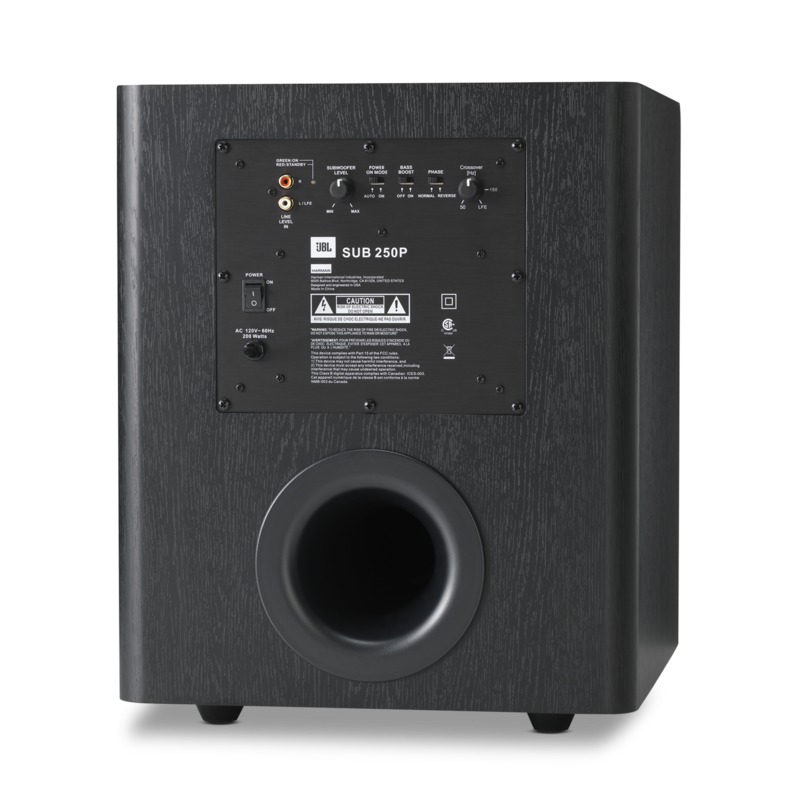 The CINEMA BASE already has its own Sub-woofer system built into it and it does not have any ports available for connecting an external Sub woofer like the SUB 250P. I have 2 JBL flips can I hook this subwoofer up to those? Is there any subwoofer that will hook up to those speakers to enrich the sound? I am trying to make an in-home sound system and don't want to have to buy new speakers. Unfortunately the subwoofer requires to be plugged in to work. The Flip cannot be connected to these subwoofers since they are mainly used as bluetooth speakers. This amp has no sub-out nor line-out, you will not be able to connect the STUDIO 250P. What kind of cord is used to power this subwoofer? This unit comes with a non detachable power cable. It's basically a 2-pin 10A 125v rated cord. You can purchase the cable from our Parts Department. The part number for the power cable is CJA523FBXA. Please submit a request at jbl.com/contactus and our Customer Service Team will be glad to assist you with pricing and availability. Hi.can i connect this sub to my eon206p? Yes, there is a way to make both of these powered speaker work together but it will be complicated and require additional equipment. 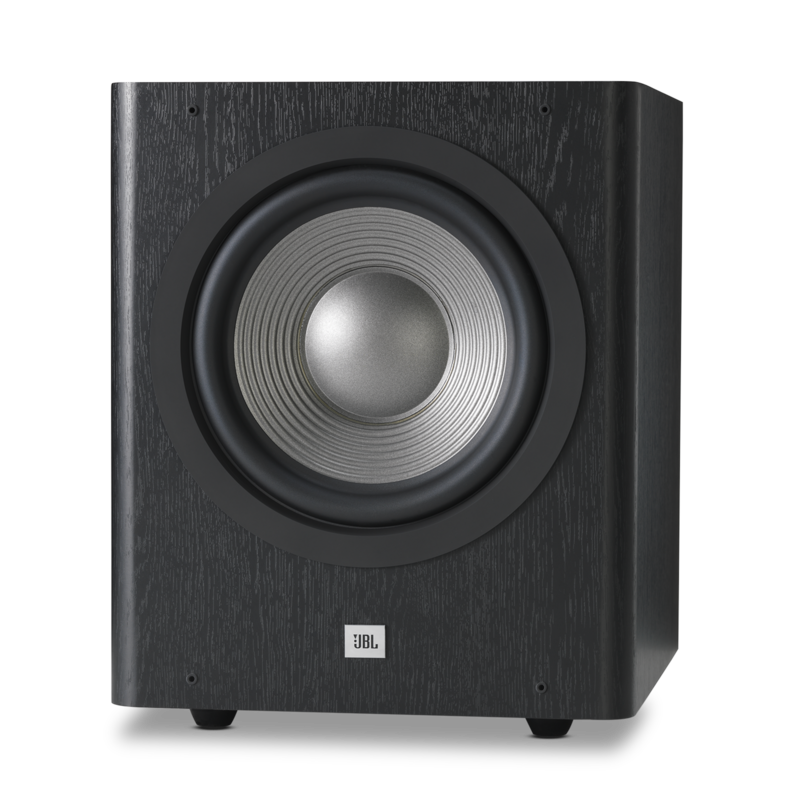 We recommend using a JBL Pro powered subwoofer with your EON 206P, it will perform and sound much better. Hello! 1) Does lfe title in crossover knob mean bypass sub crossover? 2) How crossover settings affects LFE channel? Does 80 Hz crossover setting in the sub really truncate LFE channel to 80 Hz? config: sub in: LFE. receiver out: LFE + L/R.&nbsp; Thanks. If you are connecting the SUB to the LFE output of your receiver/amp you would need to set the knob/switch all the way to max which is marked LFE to bypass the crossover in the SUB. If your connection is by way of line level/preamp out(L/R), you would need to set the crossover switch of the sub wo what is setup on your receiver/amp. For example, your receiver/amp is set to 50Hz for the sub settings, then you would need to set the sub to 50Hz as well for it to receive 50Hz and below audio frequency only. I have found that the front screen rattles/ vibrates when playing certain music, is there any solution to this problem? Sometimes it happens when the music is not very loud. When the screen is off it sounds perfect though? The grill is loose on the SUB250P when it rattles. Make sure that the grill is tightly fit on the SUB250P. If this doesn't help, please submit a case at www.jbl.com/support-contact.html and the Customer Service team will be more than happy to further assist you. There is no &ldquo;right&rdquo; setting for any subwoofer to go with any speakers. There are way too many variables (room size, curtains, pictures, rugs, etc.) that will change the sonic results within a room. I would recommend setting the sub and the speakers to 80Hz as a starting point. Live with it that way for a week or so. Then shift it up to 100Hz and see if you like it better. Then shift it down to 60Hz, and decide which way sounds best in your application.